Podcasting from Studio "B" at Kaiser H.Q., this is the big Five-Oh, friends. Eppy-sode Fifty! Jam-packed to the rafters with nothing but the most savage, greasy R&B feet slappers 'n' lease busters, baby. We've got POUNDERS from the likes of Screamin' Joe Neal, Hal Paige, Telli Mills, the A-Bones with the Great Gaylord, Tiny Lewis, Ervin Rucker, and mo' mo' MO'!! Plus all the latest news from the launching pad of Wild Sounds & Rock 'n' Roll, including the soon-to-be launched "Wild & Primitive... LIVE with Michael Kaiser". Keep up with the latest news from H.Q. on the RadiOblivion Facebook page. Its easy and form-fitting. And, boy! do we have a deal for you. Zazzle.com has teamed up with RadiOblivion to bring you a great deal: use coupon code "WILDSOUNDS10" at checkout and save 10% on purchases of $50 or more. Or, if you're a big spender, save 12% on orders of $75, or more, when you use code "WILDSOUNDS12" at checkout. 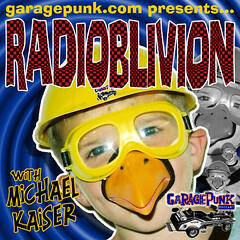 Make sure to begin yer shopping trip at the RadiOblivion Shoppe on Zazzle and look sharp!